President Muhammadu Buhari and members of his kitchen cabinet are mounting pressure on BBC Hausa Service not to broadcast the full interview granted by his wife, Aisha Buhari. The interview is due for broadcast on Saturday. Buhari has, however, told his wife, who is currently in London, to stop granting further interviews to the media, SaharaReporters has said. 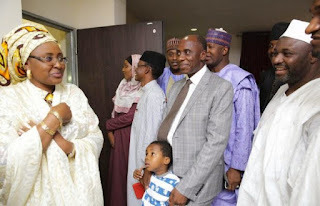 Aisha Buhari lamented that her husband was surrounded by opportunists. She noted that those who really worked for his victory in the 2015 election had been sidelined by those that didn’t participate. “This worries us a lot now. Because they believe they are the ones who suffered, but are no where today. “Those who didn’t do anything, who don’t even have voters’ cards are the ones in position, doing everything,” Aisha said. It was gathered that neither the president’s nephew, Mamman Daura or his Chief of Staff, Abba Kyari voted for Buhari in the last election as they neither possed a voter’s card nor‎ were they card-carrying members of the ruling All Progressives Congress., APC.